Tredegar House: Friends AGM: Fishing On The Lake? Friends AGM: Fishing On The Lake? Last week was the Annual General Meeting of the Friends of Tredegar House. The Newport Council Cabinet Member for Culture and Recreation (the department responsible for Tredegar House) Councillor Ron Jones was present for a question and answer session after the meeting. I went along to hear what he had to say about the future direction of Tredegar House. Councillor Jones has a long history of dealing with Tredegar House. Many years ago he was responsible for the appointment of David Freeman as curator. He indicated that this was among the best decisions he had made in the role. Certainly the spark and influence of David Freeman is still very much felt around the place today. The curator has a unique opportunity to leave their mark on Tredegar House. In his opinion, the National Trust should NEVER own Tredegar House. He was quite vehement about this. Tredegar could well have ended up in National Trust hands on a few occasions in the 20th century. Evan, Viscount Tredegar was approached by them in the late 1940s, and his cousin, John, 6th and last Baron Tredegar, contemplated the idea of Trust ownership in the 1950s (but, a Roman Catholic convert, he preferred to sell it to the Sisters of St Joseph.). Recently the idea of a 'partnership' between Newport Council and the National Trust has been suggested, but it would seem that outright Trust ownership is not currently an option. More events should be held in the grounds. Events, even small ones, give people an excuse to come to the House. Councillor Jones suggested the idea of a Farmer's Market. I thought this a good idea. Anything (within reason) that brings people to Tredegar House is a good thing; any event that is sympathetic to the history of the House and Park is even better. More needs to be done at Tredegar House in the winter. Tredegar, like many historic attractions throughout the country does tend to hibernate for the winter (Christmas excluded). This break gives the curator and house staff an important opportunity to conduct restoration and cleaning projects. Nothing should be done to disrupt the essential works that need to be done. However, with a bit of planning and imagination, perhaps more (small) events could and should be put on in the winter. It is certainly possible. Councillor Jones mentioned that this was still being discussed. There seems to me to be a powerful argument on both sides of this divide. Those in favour of a return to fishing on the lake argue that fishermen could, in essence, 'police' the lake, which would improve the security of the area. The awful treatment of the swans earlier this year is still fresh in the memory. Others would argue that fishing was banned from the lake in the 1980s mainly because of the danger to the wildlife: swans caught up in fishing lines, etc. This was my question to Councillor Jones. I had been dismayed to learn that an old rotting chestnut of an idea had been given new life earlier this year. 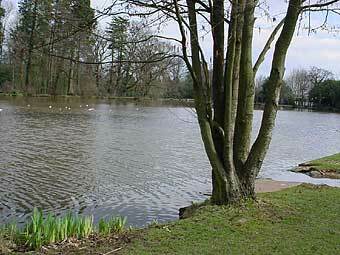 In the 1970s it was first suggested that Newport Museum should move to Tredegar House. The idea, thankfully, was rejected, and the imaginative restoration of Tredegar House as an historic home began. The idea though did not die completely and it appeared that the council was giving it consideration (albeit at an exploratory stage) earlier this year. This would have been an awful plan for both Newport Museum and Tredegar House. If there is one surefire way to reduce visitor figures at Newport Museum it would be to move the museum out of the city centre. Also, people would be less keen to visit Tredegar House if it contained glass cases and was, apart from the surroundings, like any other municipal museum. I was delighted to hear Councillor Jones confirm that the idea is now off the table. Perhaps it never was being seriously considered. Trial balloons are sometimes flown. I'm glad this one has been shot down. All in all, it was an interesting evening. Thanks must also go to the Mayor of Newport, Councillor Miqdad Al-Nuaimi, who attended and gave a very good speech. His pride in Newport shone through very clearly and was good to hear. I am convinced that the future of Tredegar House will be a very bright one. It has always been a very special place. As one ex-servant said to me: "It gets in your blood, Tredegar does." Lets hope more members of the public will visit and also catch the 'Tredegar bug'. Gosh you give the most up to date information. I am a mature student aiming for Blue Badge Guide status (2 years hence). My assignment is on Tredegar House which I can only visit from the outside! I have to research current funding, appeal/facilities for visitors, site specific health and safety consideration (none I don't think) and visitor statistics (which I cannot locate. Evolution of site ownship. Of course I have the big Tredegar House book and pamphlets. Any tips? Thanks for the message Brenda. Will send you an email.